Before I post pictures of Block 4 of Hugs and Kisses, I want to show you something really special. Joyce Dickens-Loffree from Naples, Florida sent me these photos of her quilt, which won a ribbon at her guild’s show. Do you recognize it? The pattern is Peggy’s Puzzle, a free pattern available on my website. 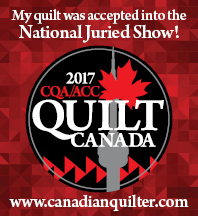 I am so honoured that Joyce chose to make this quilt. Congratulations on a spectacular finish. And the label is a wonderful addition. Block 4 of Hugs and Kisses is a nice, simple block. I am thoroughly enjoying making this quilt for a second time. As I mentioned, I am making this quilt again, but in browns and pinks. For some reason, I have a rather substantial amount of both brown and pink in my stash. So I thought this would be a good time to use some of these fabrics up. Even the stems are brown and not green:) I’m not marking the background at all, just using my light box to place all the pieces. The hardest part was deciding where each leaf should go. I am absolutely obsessed with the I Spy quilts I am working on for my 2 granddaughters. Every morning I get up early and hand-piece a block or two. What a great way to start the day. The pattern is called Smitten by Jen Kingwell. So much fun! I’m so excited to announce I will be teaching again at The Academy of Applique in Williamsburg in 2019. I can’t wait!! When I teach classes, I supply the freezer paper templates already traced, so within a couple of hours, the students have actually accomplished something. Such a good feeling. I asked the ladies in the group to write a testimonial about their experience. Here are a couple for you to read. would be. Felt like being wrapped in a warm quilt. And the food was the best. Can’t wait till next year for the next retreat. Jude writes…What a wonderful and amazing time we shared at the Fireside Retreat with Kerry Burke. Kerry is not only an amazing appliqué and quilter, but also an outstanding teacher. The preparation that Kerry did to set up our wall hanging, prior to the start of the retreat, allowed us to jump right in with helpful hints and learning new techniques. Without her prep work, we couldn’t have started stitching our projects. If you are interested in appliqué, there is no better person to learn from than Kerry. The Retreat itself is so beautiful. Decorated with quilts in every room, Fireside Retreat made us feel so warm and welcomed. Can’t wait to do it again.